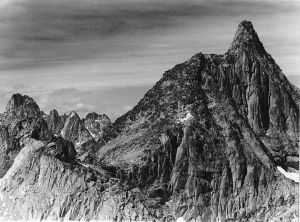 Brenta Spire is the highest and middle of the three granite spires on a cirque west of Cobalt Lake. Its west face drops down to the Vowell Glacier. The summit is blocky but the rock is generally better than nearby Cobalt Lake Spire. All summit routes are scrambles.